Spruce up your living room, family room, or den with our Artesa Sofa Table, just one of our many styles of beautiful occasional tables. Choose your favorite wood type and finish to make it uniquely your own. Need a special size to compliment your area? No problem, we can do that too! 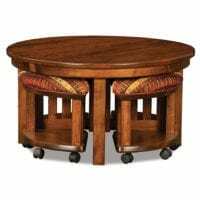 Whether a coffee table, sofa table, or end tables; solid wood and Amish craftsmanship make all our occasional tables the sturdy heirloom quality you expect from us at Herron’s. Not to mention the beauty that naturally comes with any of our hand crafted pieces. Spruce up your living room, family room, or den with our Boulder Creek Lift Coffee Table, just one of our many styles of beautiful occasional tables. Choose your favorite wood type and finish to make it uniquely your own. Need a special size to compliment your area? No problem, we can do that too! Whether a coffee table, sofa table, or end tables; solid wood and Amish craftsmanship make all our occasional tables the sturdy heirloom quality you expect from us at Herron’s. Not to mention the beauty that naturally comes with any of our hand crafted pieces. Our Oval Magazine Stand is a unique multi-purpose end table/ magazine rack to keep your most up to date newspapers, books, or magazines right at your fingertips. It is available with or without the added convenience of a built in 3-way light. Choose your favorite wood type and finish to make it uniquely your own. Need a special size to compliment your area? No problem, we can do that too! The term “Amish Furniture” brings to mind not only beautiful craftsmanship, but also solid wood and heirloom quality. But not all Amish furniture is the same. At Herron’s, we have been forging relationships with our Amish builders for more than 20 years- choosing only the cream of the crop, the best of the best, to sell to our customers. This ensures you decades to enjoy your new addition to your home. The 5 Piece Round Table Bench Set is a uniquely functional addition to your home. Perfect for events like family get togethers, this set functions as a coffee table until you are in need of additional table and seating space- then transform it into an eating or game table and chairs in seconds! Choose your favorite wood type, finish, and fabric to make it uniquely your own. Solid wood and Amish craftsmanship make all our benches and chests sturdy heirloom quality. Not to mention the beauty that naturally comes with any of our hand crafted pieces. The 5 Piece Square Table Bench Set is a uniquely functional addition to your home. Perfect for events like family get togethers, this set functions as a coffee table until you are in need of additional table and seating space- then transform it into an eating or game table and chairs in seconds! There is even storage in the seats! Choose your favorite wood type, finish, and fabric to make it uniquely your own. Solid wood and Amish craftsmanship make all our benches and chests sturdy heirloom quality. Not to mention the beauty that naturally comes with any of our hand crafted pieces.